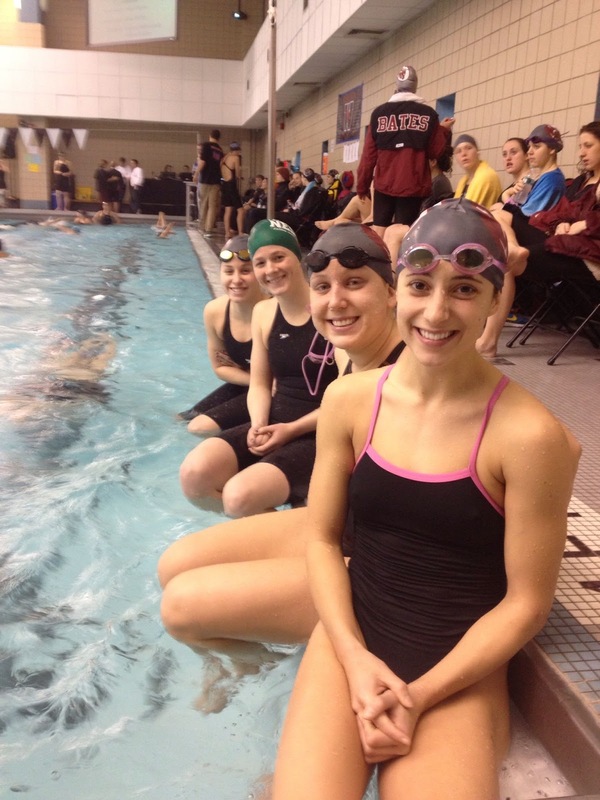 BOBCATS A SURPRISE 5th AT NESCACS! 2013 Lady 'Cats on the prowl! How can fifth be a surprise when it has happened three years in a row? Well, from my perspective... a) we lost to both Bowdoin and Conn in our dual meets. b) both were seeded ahead of us on paper leading into the meet. And c) did I mention we lost ten days prior 188-93 to the Camels? I knew it would be close with Bowdoin, but I was optimistic that 6th would be where we landed given the talent level we had to surpass. OK, so we benefited from our depth, and keeping our eyes on NESCACs - even if it meant getting smoked in our last dual meet. But seeing our ladies scratch and claw themselves into 5th - and deal with the injuries, illness, and even a few DQ's - made this 5th very special. It was hard fought and well earned. Anytime there is 10 points between 5th and 7th you know all three teams had to show grit and a warrior-like attitude. I have to give a ton of credit to Bowdoin and Conn. They dealt with adversity along the way too... and their ladies swam unbelievable - while having a tremendous attitude. It was a great meet all around - and I am terribly proud of what the team accomplished this weekend. Highlights on the last night include Melissa Paoine dropping serious time at night in the 2 breast (2:28). Elle and Caroline going 1-2 in their heat for the 100 free (52.7/ 53.2). Anne Schwarzwalder dropping 3 seconds from her morning swim to win her heat in the 200 back (2:09! ), and Ally Skaperdas getting faster at night in the 200 fly too. 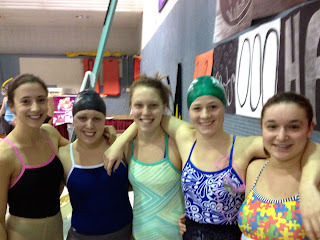 (It seemed like she could have kept getting better if we had 3 more days of swimming!) We also saw our 3 milers score! (Bouch 10th, Dugan 15th, and Nelson 19th!). Having 12 scoring swims in the final evening was a great way to wrap it up. In the end I have to admit, this was tiring - but extremely rewarding. We have so much to celebrate - and so much to look forward to also. 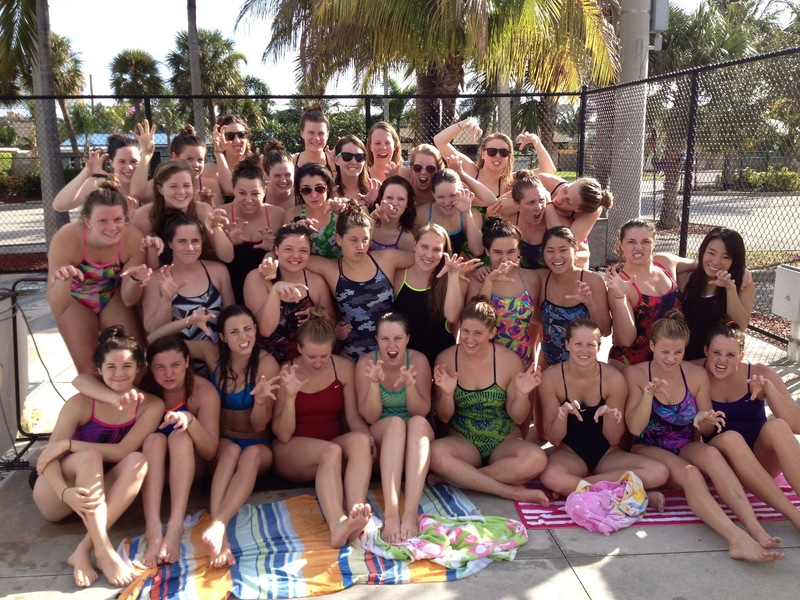 The team swam their best in their last meet of the season - everyone did. That is such a tribute the ladies in this program. I came here 6 years ago and was amazed at how much trust and faith the team had in me and the program. I watched in amazement as they surprised the entire conference with a team of 15 turning heads and being so competitive in every race they swam. For 6 years I have continued to see that legacy, that Coach Mulholland started 18 years ago, continue on. (I was proud to have him on deck this weekend to see our team in action as an official. He has always stayed involved, continues to help the sport, and he is always there for us. Thank you Dana!). Seniors the night before we left. It is something special to be a Bobcat swimmer... and the team showed us again how hard they work, and how much they believe. The seniors went out in style passing the legacy that is Bates' NESCAC swimming to the underclassmen - and I feel great about what is yet to come!